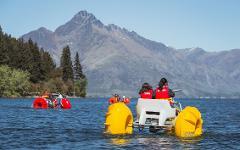 Try our famous Aqua Bikes and pedal your way around the stunning Queenstown Bay. A great activity for all ages providing a memorable experience and fantastic photographs. The brightly coloured big wheel bikes allow you to sit high above the water ensuring you get the best view of all the sights and activities the bay has to offer. Far easier than a normal bike and simple to manoeuvre. There is a low risk of you getting wet, but our staff will still ensure you are fitted with a lifejacket before giving you a short safety briefing and sending you out onto the lake. The bikes are designed for up to 2 passengers but can also be ridden solo giving you the option to race your friends on a bike each. If you are looking for a fun spontaneous activity this is for you! Single Kayak Rental 45 minutes $25 per person. Max Weight 100kg. Minimum ages 8yrs old** (Weather permitting) Sit-top kayaks are used to ensure your safe and comfortable at all times. Whether your a first-timer kayaker or have done it before getting out on Lake Wakatipu is something that should not be missed! Sit-on-top kayaks are fun, stable and extremely easy to use and a great activity for all ages and abilities. High levels of fitness are not required. Paddle at your own pace or simply use the time to take photos that will be the envy of friends and family. Once we have signed you in, lifejackets will be provided, a short safety briefing and you will be shown the area to kayak. If you have no experience do not worry as we will show you the basics of kayaking before letting you practice your new skills on the water. As soon as you are sitting comfortably in your kayak, our staff will launch you into the water and you will be off explore the Queenstown Bay at your leisure! **Price if per kayak (2 seats in kayak) - 45 minutes $25 per person. Total max weight 200kg. Excellent for adults and small children. Sit-top kayaks are used to ensure your safe and comfortable at all times. Floating across crystal clear water with the sun on your face is the perfect way to relax and make memories. Our high quality, New Zealand made, double kayaks are ideal for those who want to share the experience with someone else. Perfect as a fun way for children to learn to paddle or hitch a ride up front with a parent. Extremely easy to use and a great activity for all ages and abilities. High levels of fitness are not required as you can paddle at your own pace or simply use the time to take photos of the seemingly endless mountain ranges and rugged landscape. Our staff will provide you with a lifejacket and give you a short safety briefing before sending you out into Queenstown Bay. If you have no experience do not worry as we will show you the basics of kayaking before letting you practice your new skills on the water. Stand Up Paddle Board (SUP) 45 minutes. $25 per person. Max Weight 120kg. Minimum ages 8yrs old** (Weather permitting) One person per board, sorry not pets! We use the worlds most popular SUPs - Red Paddle Co inflatables. Stand-Up Paddle Boards provide a great water sport experience. There is nothing that compares to the feeling of gliding across beautiful water whilst standing on your feet. 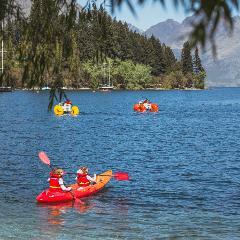 Paddle boarding is far easier than it looks especially as you will be paddling in the sheltered Queenstown Bay. No experience whatsoever is necessary. 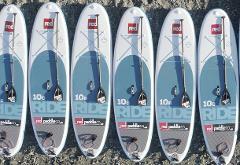 We provide the world’s most popular Red Paddle Co boards that come in various sizes to suit ability and weight. If it is your first time on a paddle board, we will give you a brief demonstration on how to use the equipment properly and ensure your paddle is adjusted to the correct height. If you are new to paddle boarding, we advise starting on your knees – which makes for a very stable paddling experience - before progressing to your feet. Then, with your life jacket fitted, you will ready to enjoy the lake. 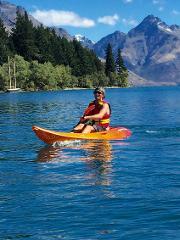 Come and see why paddle boarding is so popular and see Queenstown from truely unique perspective.